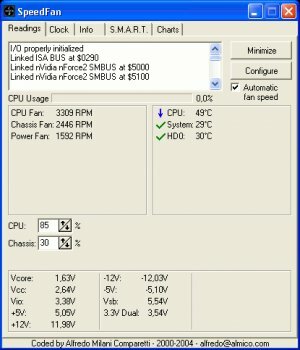 SpeedFan monitors fan speeds, temperatures and voltages in computers with hardware monitor chips. It can even access S.M.A.R.T. info for those hard disks that support this feature and show hard disk temperatures too, if supported. It can even change the FSB on some hardware. At the lowest level, it is a hardware monitor software, but its main feature is that it can control fan speeds according to the temperatures inside your pc, thus reducing noise and power consumption. Made my fans fun so fast it sucked the cat into the PC case, I never noticed they were running fast though. Good, interface a bit dated but it's free & does the job well. How much voltage did you put on it? A classic piece of freeware. Yea, the interface is what it is. However, it is probably best kept complex to prevent accidental misconfiguration by the layman. A little intimidation on advanced projects is sometimes appropriate. The author also has a minimalist design to his web sites, except for the ads, which are a little aggressive. He might tone them down, but that's the site. Software is good. This %&¤&%¤% destroyed one tiny fan on my mobo ! If i knew that all fans where set to 100% when Windows were shut down i had prevented this disaster. It was a while ago, but i warn people from using this without going throuth all settings properly, twice !!!! Nope, it was NOT my fault the setting were 100% after install and the 1st start. I can only blame the program. I usually always check settings properly in software i install. I didn't with this one. That fan it destroyed should never have a speed above 25%. To You below who blame me, got to H ! Put the new SIW on. Great features, but latest versions needs admin rights to start it meaning it can't be run on startup anymore without a hassle. This makes it pretty much useless for me now. It is frustrating that this app STILL does not accurately detect and identify elements on various motherboards, GPU and other items. I want my CPU information to be 100% correct and labeled, the same with my GPU. Nvidia GTX 460 for example with a 6 core Intel system and a Gigabyte motherboard seems to baffle this app. Why are the fans / temperature, etc. not properly identified and labeled? I just don't get it. It seems now in order to download the file to try it out you get redirected to the authors web site, then you have to 'register' or 'login' in order to access the download. Thanks but No thanks. Thanks, love this app prevented a failure at least once for me. I use it on all my PC's but especial like using it with MediaPortal to show information about my system on my HTPC. Poor support. Needed help - got none ! Therefore i rate it as a 1 only !